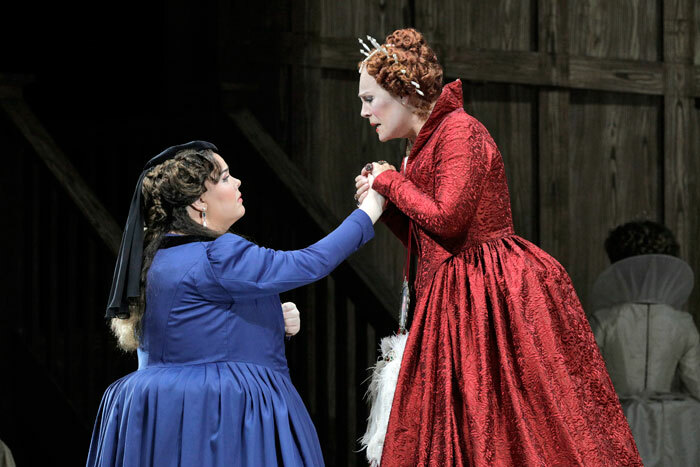 San Francisco Opera goes back to Tudor times for the second production of the Fall Season – Gaetano Donizetti’s Roberto Devereux. The opera opened on Saturday evening, and continues its run on Tuesday, September 11th. 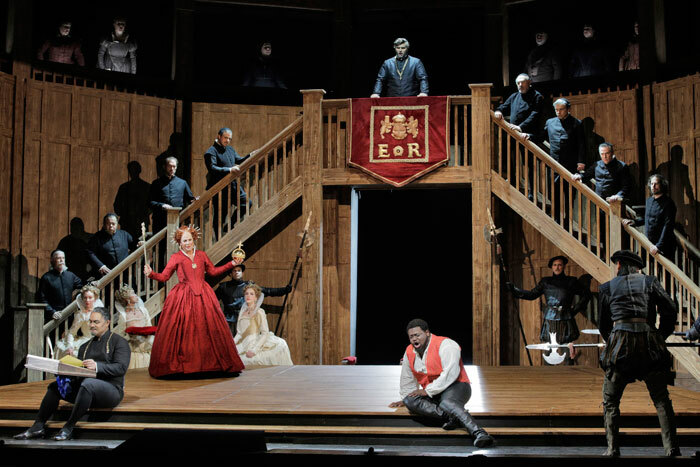 Roberto Devereux is the third in what’s known as Donizetti’s ‘Tudor Trilogy’ – preceded by Anna Bolena and Maria Stuarda – although the operas were apparently not designed as such. This Canadian Opera Company production – which is new to San Francisco Opera – stars soprano Sondra Radvanovsky as Elisabetta, and tenor Russell Thomas as Devereux, and is led by Italian conductor Riccardo Frizza. Maestro Frizza made his debut with the Company in 2011 with another Donizetti work, Lucrezia Borgia, appearing again with Bellini’s I Capuleti e i Montecchi in 2012, and again in 2014 with Puccini’s Tosca. Having conducted orchestras such as the Maggio Musicale Orchestra in Florence, Rome’s Accademia di Santa Cecilia, London’s Philharmonia Orchestra, and Staatskapelle Dresden, Riccardo Frizza has been appointed first musical director of the Donizetti Festival, the inaugural season of which takes place in November this year. 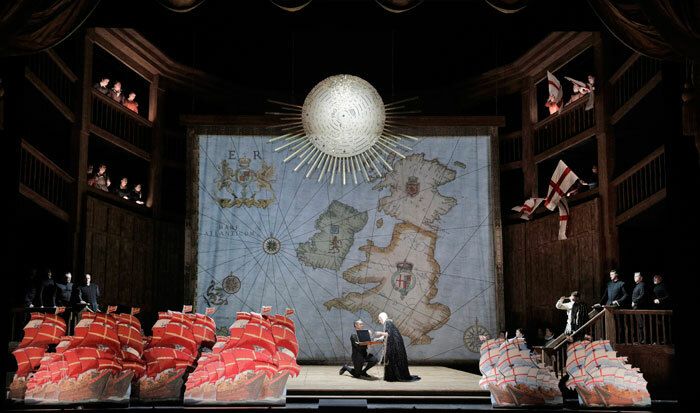 Roberto Devereux is directed by Stephen Lawless, who headed up productions for the Glyndebourne Touring Opera from 1986 to 1991, where his highly successful production of Benjamin Britten’s Death in Venice was recorded by the BBC for television and video release. He also has the honor of having produced the first ever live telecast of an opera from the Soviet Union to the UK, with his debut production of Mussorgsky’s Boris Godunov for the Kirov Opera in Leningrad. Other companies, aside from San Francisco Opera, for which he has directed include The Royal Opera House, Covent Garden, the Vienna State Opera, Washington, and Los Angeles Opera, and for Nürnberg Opera he directed the complete Ring cycle. 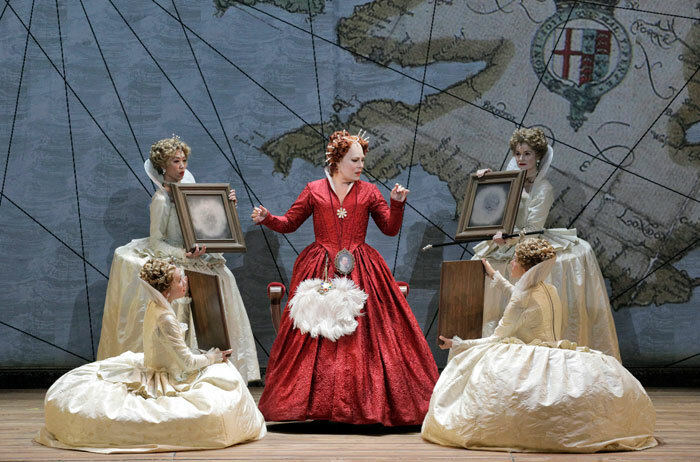 The libretto for Roberto Devereux is by Salvatore Cammarano, and is thought to have been based largely on Felice Romani’s Il Comte d’Essex – but Cammarano is also said to have drawn for his material on the work of two French authors, Pierre Corneille and Francois Ancelot. Whatever the truth, Donizetti and Cammarano’s interpretation of the story of the romantic association between Elizabeth I and Robert Dudley, Earl of Essex, might not be historically accurate, but it certainly makes a dramatic plot for an opera. 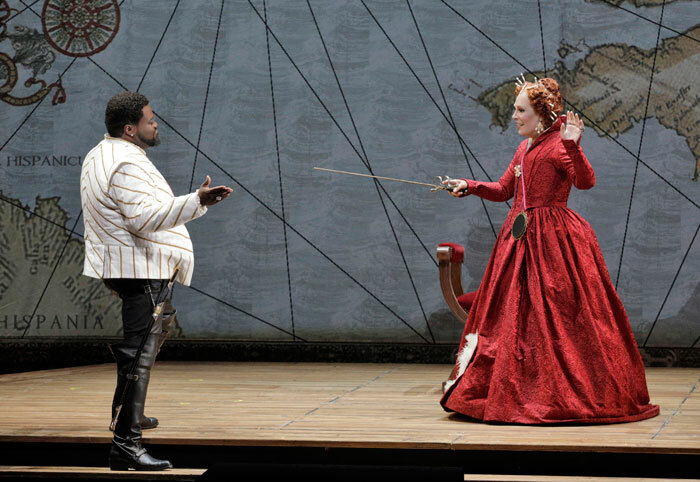 In Donizetti’s opera, Elisabetta is in love with Roberto Devereux, the Earl of Essex, whom she has sent to lead a military expedition to Ireland. Against her orders, he has signed a peace treaty with the Irish rebels, and her advisors, fueled by jealousy of his favored position at Court, use this opportunity to issue a charge of treason against him. Elisabetta faces the terrible choice of acknowledging where her loyalty lies – with her country or the man she loves. She then discovers that he has betrayed her – as well as his friend and ally, the Duke of Nottingham – by conducting an illicit affair with Nottingham’s wife, Sara. When Lord Cecil informs Elisabetta that Parliament has reached a decision and that Devereux faces the death penalty, she is forced to sign his death warrant, but strain of these events causes her to lose confidence in herself, and she relinquishes her crown in favor of King James of Scotland – her nephew and heir to the throne. The 1837 premiere of Roberto Devereux, at the Teatro San Carlo, was only moderately successful, and the work lay largely unperformed from about 1850 until the renewed interest in music of bel canto in the latter part of the 20th century. The role of Elisabetta is sung by Sondra Radvanovsky, one of the premier exponents not only of the Verdi repertoire, but also acknowledged as one of the finest interpreters of bel canto. Ms Radvanovsky made her San Francisco Opera debut in 2009 as Leonora in Il Trovatore, and returned in 2014 in the title role in Bellini’s Norma – her first performance in the opera. During the 2015-16 season she became the first singer in the history of the Metropolitan Opera to sing the soprano leads of Donizetti’s ‘three queens’ in his Tudor dramas. The New York Times described her performance as Queen Elizabeth as “an emotionally vulnerable and vocally daring performance, a milestone in the career of an essential artist”. Russell Thomas – described by The New York Times as “a tenor of gorgeously burnished power” – made his San Francisco Opera debut as Pollione in Norma in 2014, and now returns to the Company in another role debut – the title role in Roberto Devereux. Known for his vivid character portrayals, Mr Thomas has more recently appeared in the title role of La Clemenza di Tito at the Salzburg Festival and Dutch National Opera, the title role of Don Carlo at Washington National Opera, Rodolfo in La Bohème at the Metropolitan Opera, Cavaradossi in Tosca with Los Angeles Opera, Ismaele in Nabucco at the Metropolitan Opera, and Mao Tse-Tung in John Adams’ Nixon in China with the Los Angeles Philharmonic. 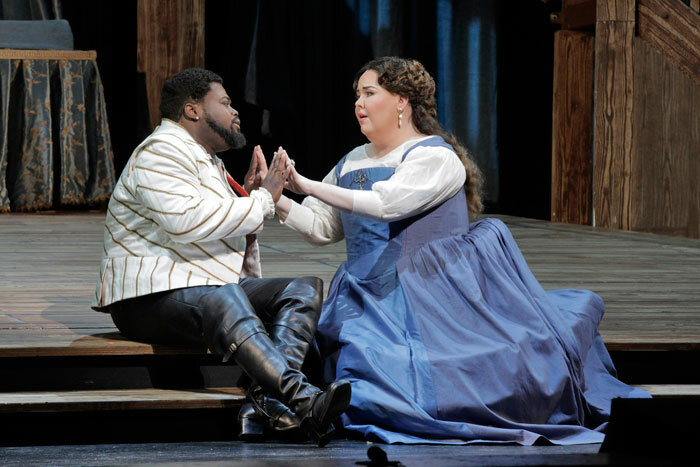 Mezzo soprano Jamie Barton debuted at San Francisco Opera in 2014 as Adalgisa in Norma, a role which she has more recently performed with the Metropolitan Opera, Houston Grand Opera and Los Angeles Opera. Multi-awarding-winning Ms Barton has recently added yet another trophy to her cabinet – her debut solo album, All Who Wander, has won the 2018 BBC Music Magazine Vocal Award. Joyce DiDonato has said of Ms Barton: “The world has been waiting for this voice for a long time – one that reminds you of how capable the human voice is of creating something of absolute beauty”. Jamie Barton will also appear for San Francisco Opera as Jezibaba in Dvořák’s Rusalka next spring. The role of the Duke of Nottingham is sung by Romanian-American baritone Andrew Manea who, as a second-year Adler Fellow, made his Company debut as Marullo in Verdi’s Rigoletto in 2017 and appeared as Marquis d’Obigny in La Traviata last season. As a participant of the 2016 Merola Opera Program, Mr Manea appeared as Iron Hans/Wolf in the production of Conrad Susa’s Transformations. New Zealand tenor Amitai Pati appears as Lord Cecil. In 2016 he took his first principal role, as Ferrando in Mozart’s Cosi fan tutte, for the Merola Opera Program, having won the Lexus SongQuest in 2012, and was invited to join the Young Singers Project in Salzburg, where he appeared in La Favorite with Elīna Garanča, Juan Diego Flórez and Ludovic Tézier, and took the tenor solo role in a production of Mozart’s Spatzenmesse. Base-baritone Christian Pursell, a national semi-finalist of the 2016 Metropolitan Opera National Council Auditions, sings the role of Walter Raleigh. His performance as Dandini in the 2017 Merola Opera Program production of La Cenerentola was highly acclaimed, and this season he will be appearing for San Francisco Opera as a jailer in Tosca, as Count Lamoral in Richard Strauss’ Arabella, and as a member of the Angel Quartet in Heggie’s It’s a Wonderful Life. 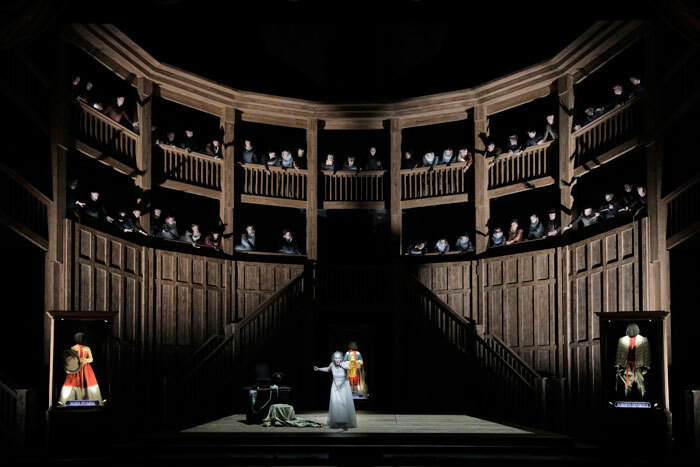 Riccardo Frizza leads the San Francisco Opera Orchestra and Chorus (Director Ian Robertson) in Donizetti’s Roberto Devereux – sung in Italian with English supertitles – until September 27th. For performance dates and tickets, visit the San Francisco Opera website.